Motorola Mobility (often known as Motorola) is a Chinese-American consumer electronics and telecommunications company founded on January 4, 2011 from a split by Motorola, owned by Lenovo and based in Chicago, Illinois. From the split, Motorola Mobility took on the company's consumer-oriented product lines, including its mobile phone business and its cable modems and set-top boxes for digital cable and satellite television services, while Motorola Solutions retained the company's enterprise-oriented product lines. The company primarily manufactures smartphones and other mobile devices running the Android operating system developed by Google; in August 2011, only several months after the split, Google acquired Motorola Mobility for US$12.5 billion. Google's stated intent for the purchase was to gain control of Motorola Mobility's portfolio of patents, so it could adequately protect other Android vendors from lawsuits. The deal closed in May 2012, after which it also sold its cable modem and set-top box business to Arris Group. Under Google ownership, Motorola Mobility increased its focus on the entry-level smartphone market, introduced one of the first Android Wear smartwatches, and also began development on Project Ara, a platform for modular smartphones with interchangeable components. Google's ownership of the company would be short-lived, as it announced in January 2014 that it would sell most of Motorola Mobility to Chinese technology Lenovo for $2.91 billion. The sale, which excluded all but 2000 of Motorola's patents and ATAP, it's team-based division who worked on Ara, was completed on October 30, 2014. Lenovo disclosed an intent to use Motorola Mobility as a way to expand into the United States smartphone market. In January 2016, following the August 2015 merger of Lenovo's existing smartphone business with Motorola Mobility, it was announced that the company would begin to phase out "Motorola" as a public-facing brand, replacing it with the "Moto" brand used on most of its recent devices, and Lenovo's "Vibe" brand. However, Motorola later clarified that the brand will continue, but marketing will focus on its "Moto" and "Vibe" brands, whereas the Motorola brand will appear on packaging and, also, its licensees. On January 5, 2011, Motorola Inc. was split into two publicly traded companies; Motorola Solutions took on the company's enterprise-oriented business units, while the remaining consumer division was spun off to form Motorola Mobility. Motorola Mobility consisted of the Mobile Devices business, which produced smartphones, mobile accessories including Bluetooth headphones, and the Home business, which produced set-top boxes, end-to-end video solutions, cordless phones, and cable modems. On August 15, 2011, Google announced that it would acquire Motorola Mobility for $12.5 billion, pending regulatory approval. Critics viewed Google as being a white knight, since Motorola had recently had a fifth straight quarter of losses. Google planned to operate Motorola as an independent company. In a post on the company's blog, Google CEO and co-founder Larry Page revealed that Google's acquisition of Motorola Mobility was a strategic move to strengthen Google's patent portfolio; at the time, the company had 17,000 patents, with 7,500 more patents pending. The expanded portfolio was to defend the viability of its Android operating system, which had been the subject of numerous patent infringement lawsuits between device vendors and other companies such as Apple, Microsoft and Oracle. On November 17, 2011, Motorola announced that its shareholders voted in favor of the company's acquisition by Google for $12.5 billion. The deal received regulatory approval from the United States Department of Justice and the European Union on February 13, 2012. The deal received subsequent approval from Chinese authorities and was completed on May 22, 2012. Alongside the completion of the acquisition, Motorola Mobility's CEO Sanjay Jha was replaced by Dennis Woodside, a former Senior Vice President at Google. On August 13, 2012, Google announced that it would cut 4,000 employees and close one third of the company's locations, mostly outside the United States. On December 19, 2012, it was announced that Arris Group would purchase Motorola Mobility's cable modem and set-top box business for $2.35 billion in a cash-and-stock transaction. In May 2013, Motorola opened a factory in Fort Worth, Texas, with the intent to assemble customized smartphones in the United States. At its peak, the factory employed 3,800 workers. On April 9, 2014, following the departure of Woodside, lead product developer Rick Osterloh was named the new president of Motorola. Under Google ownership, Motorola's market share would be boosted by a focus on high-quality entry-level smartphones, aimed primarily at emerging markets; in the first quarter of 2014, Motorola sold 6.5 million phones—led by strong sales of its low-end Moto G, especially in markets such as India, and in the United Kingdom—where the company accounted for 6% of smartphone sales sold in the quarter, up from nearly zero. These goals were compounded further by the May 2014 introduction of the Moto E—a low-end device aimed at first-time smartphone owners in emerging markets. In May 2014, Motorola announced that it would close its Fort Worth factory by the end of the year, citing the high costs of domestic manufacturing in combination with the weak sales of the Moto X (which was customized and assembled at the plant) and the company's increased emphasis on low-end devices and emerging markets. On January 29, 2014, Google announced it would, pending regulatory approval, sell Motorola Mobility to the Chinese technology firm Lenovo for US$2.91 billion in a cash-and-stock deal, seeing the sale of $750 million in Lenovo shares to Google. Google retained the Advanced Technologies & Projects unit (which was integrated into the main Android team), and all but 2000 of the company's patents. Lenovo had prominently disclosed its intent to enter the U.S. smartphone market, and had previously expressed interest in acquiring Blackberry, but was reportedly blocked by the Canadian government due to national security concerns. Lenovo's CEO Yang Yuanqing stated that "the acquisition of such an iconic brand, innovative product portfolio and incredibly talented global team will immediately make Lenovo a strong global competitor in smartphones". The acquisition was completed on October 30, 2014. The company remained headquartered in Chicago, and continued to use the Motorola brand, but Liu Jun—president of Lenovo's mobile device business, became the company's chairman. On January 26, 2015, owing to its new ownership, Motorola Mobility re-launched its product line in China with the local release of the second generation Moto X, and an upcoming release of the Moto G LTE and Moto X Pro (a re-branded Nexus 6) in time for Lunar New Year. Lenovo maintained a "hands-off" approach in regards to Motorola's product development; head designer Jim Wicks explained that "Google had very little influence and Lenovo has been the same." The company continued to engage in practices it adopted under Google, such as the use of nearly "stock" Android, undercutting competitors' pricing while offering superior hardware (as further encouraged by Lenovo), and placing a larger focus on direct-to-consumer selling of unlocked phones in the United States market (as opposed to carrier subsidized versions). On July 28, 2015, Motorola unveiled three new devices, and its first under Lenovo ownership—the third-generation Moto G, Moto X Play, and Moto X Style—in three separate events. In August 2015, Lenovo announced that it would merge its existing smartphone division, including design, development, and manufacturing, into the Motorola Mobility unit. The announcement came in addition to a 3,200 personnel job cut across the entire company. As a result of the change, Motorola Mobility will be responsible for the development and production of its own "Moto" product line, as well as Lenovo's own "Vibe" range. In November 2016, it was announced that Lenovo would stop releasing smartphones under its own name and the Vibe brand, and that all future smartphones would carry the "Moto" brand. Since July 2003, Motorola released the Razr V3 in the third quarter of 2004. Because of its striking appearance and thin profile, it was initially marketed as an exclusive fashion phone, but within a year, its price was lowered and it was wildly successful, selling over 50 million units by July 2006. 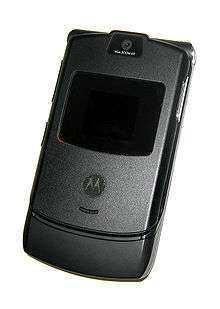 Over the Razr four-year run, Motorola sold more than 130 million units, becoming the bestselling clamshell phone in the world. Motorola released other phones based on the Razr design as part of the 4LTR line. These include the Pebl U6, Slvr L6, Slvr L7 (more expensive variant of Slvr L6), Razr V3c (CDMA), Razr V3i (with upgraded camera and appearance), V3x (supports 3G technology and has a 2-megapixel camera), Razr V3xx (supports 3.5G technology) and Razr maxx V6 (supports 3.5G technology and has a 2-megapixel camera) announced on July 2006. The Razr series was marketed until July 2007, when the succeeding Motorola Razr2 series was released. Marketed as a more sleek and more stable design of the Razr, the Razr 2 included more features, improved telephone audio quality, and a touch sensitive external screen. The new models were the V8, the V9, and the V9m. However, Razr2 sales were only half of the original in the same period. Because Motorola relied so long upon the Razr and its derivatives and was slow to develop new products in the growing market for feature-rich touchscreen and 3G phones, the Razr appeal declined while rival offerings like the LG Chocolate, BlackBerry, and iPhone captured, leading Motorola to eventually drop behind Samsung and LG in market share for mobile phones. Motorola's strategy of grabbing market share by selling tens of millions of low-cost Razrs cut into margins and resulted in heavy losses in the cellular division. Motorola capitalized on the Razr too long and it was also slow adopting 3G. While Nokia managed to retain its lead of the worldwide cellular market, Motorola was surpassed first by Samsung and then LG Electronics. By 2007, without new cellphones that carriers wanted to offer, Motorola sold tens of millions of Razrs and their offshoots by slashing prices, causing margins to collapse in the process. In January 2007, then-CEO of Motorola Ed Zander rode a yellow bike onto the stage in Las Vegas for his keynote speech at the Consumer Electronics Show. Zander departed for Dell, while his successor failed to turn around the struggling mobile handset division. Motorola continued to experience severe problems with its cellphone/handset division in the latter-2000s, recording a record $1.2 billion loss in Q4 2007. Its global competitiveness continued to decline: from 18.4% market share in 2007, to 9.7% by 2008. By 2010 Motorola's global market share had dropped to seventh place, leading to speculation of bankruptcy of the company. While Motorola's other businesses were thriving, the poor results from the Mobile Devices Unit as well as the 2008 financial crisis delayed the company plans to spinoff the mobile division. In 2008, Sanjay Jha took over as co-chief executive officer of Motorola's mobile device division; under Jha's control, significant changes were made to Motorola's mobile phone business, including most prominently, a shift to the recently introduced Android operating system as its sole smartphone platform, replacing both Symbian and Windows Mobile. In August 2009, Motorola introduced the Cliq, its first Android device, for T-Mobile USA. The device also featured a user interface known as Motoblur, which aimed to aggregate information from various sources, such as e-mail and social networking services, into a consistent interface. A month later, Motorola unveiled the Droid, Verizon Wireless's first Android phone, which was released on November 8, 2009. Backed with a marketing campaign by Verizon, which promoted the device as a direct competitor to the iPhone with the slogan "iDon't", "Droid Does", the Droid was a significant success for Motorola and Verizon; Flurry estimated that at least 250,000 Droid smartphones had been sold in its first week of availability. PC World considered the sales figures to be an indicator of mainstream growth for the Android platform as a whole. The Droid was also named "Gadget of the Year" for 2009 by Time. Other Droid-branded devices would be released by Verizon, although not all of them were manufactured by Motorola. In 2010, Motorola released the Droid X along with other devices such as the Charm, Flipout, and i1. In July 2010, Motorola reported that it had sold 2.7 million smartphones during the second quarter of 2010; an increase of 400,000 units over the first quarter. Jha stated that the company was in "a strong position to continue improving our share in the rapidly growing smartphone market and [improve] our operating performance." In its third quarter earnings report, Jha reaffirmed that the Droid X was selling "extremely well". On January 5, 2011, Motorola Mobility announced that the Atrix 4G and the Droid Bionic were headed to AT&T and Verizon, respectively, with expected release dates in Q1 of 2011. The Atrix was released on February 22 as the world's first phone with both a Dual-Core Processor and 1 GB of RAM. The phone also had optional peripherals such as a Multimedia Dock and a Laptop Dock which launched a Webtop UI. On February 24, two days after the release of Atrix, the company released Motorola Xoom, the world's first Android 3.0 tablet, and followed it up shortly afterwards with an update to make it the world's first Android 3.1 tablet. In the fourth quarter of 2011, Motorola unveiled the Droid RAZR, the world's thinnest 4G LTE smartphone at that time at just 7.1 mm. The Droid Razr featured Kevlar backing, the same used in bulletproof vests, and a Gorilla Glass faceplate. The phone was very successful through Verizon Wireless, and many color variants of it were released. In addition, a Maxx version of the Droid RAZR with an extended battery was released at CES 2012. The Droid RAZR MAXX won CTIA's "Best Smartphone" award. The company also announced new products by late 2011 and early 2012 such as the Xoom 2 tablets, the motoACTV fitness watch with Android, and the Droid 4 with 4G LTE for Verizon Wireless. Though Jha managed to restore some of the lost luster to Motorola Mobility, it still struggled against Samsung and Apple. Even among Android manufacturers, Motorola had dropped behind Samsung, HTC, and LG in market share by the second quarter of 2011. This may have been due to the delay in releasing 4G LTE-capable devices, as well as setting the prices of its new products too high. Jha was replaced by Dennis Woodside as CEO by May 2012, when the Google acquisition was complete. Motorola released the Droid RAZR HD (and Droid RAZR MAXX HD) as its 2012 flagship devices, featuring improvements over 2011's RAZR. A lower end RAZR M was released, along with an Intel powered RAZR i. Through late 2012 until 2013's third quarter, no further devices were released, except for the lower end RAZR D1 and D3 devices for Latin America. In an August 2013 interview, Motorola Corporate VP of product management Lior Ron explained that the company will focus on the production of fewer products to focus on quality rather than quantity. Ron stated, "Our mandate from Google, from Larry, is really to innovate and take long-term bets. When you have that sort of mentality, it’s about quality and not quantity". Speaking at the D11 conference in Palos Verdes, California, in May 2013, Motorola CEO Dennis Woodside announced that a new mobile device would be built by his company at a 500,000 square-feet facility near Fort Worth, Texas, formerly used by Nokia. The facility will employ 2,000 people by August 2013 and the new phone, to be named "Moto X", will be available to the public in October 2013. The Moto X featured Google Now software, and an array of sensors and two microprocessors that will mean that users can “interact with [the phone] in very different ways than you can with other devices”. Media reports suggested that the phone will be able to activate functions preemptively based on an "awareness" of what the user is doing at any given moment. On July 3, 2013, Motorola released a full-page color advertisement in many prominent newspapers across the United States. The advertisement claimed that Motorola's next flagship phone will be "the first smartphone designed, engineered, and assembled in the United States". On the same day that the advertisement was published, ABC News reported that customers will be able to choose the color of the phone, as well as add custom engravings and wallpaper at the time of purchase. In early July 2013, the Wall Street Journal reported that Motorola will spend nearly US$500 million on global advertising and marketing for the device. The amount is equivalent to half of Apple's total advertising budget for 2012. On August 1, 2013, Motorola Mobility unveiled the Moto X smartphone. It was released on August 23, 2013 in the United States and Canada. On September 5, 2014, Motorola Mobility released the Moto X (2nd generation) smartphone. This continued the trend of the company letting consumers customize their devices through their Moto Maker website, and added new customization options like more real wood choices and new leather options. The device itself also got many bump-ups in specs; with a new 5.2 inch (13 cm) 1080p super AMOLED pentile display, a faster 2.5 GHz Qualcomm Snapdragon 801 processor, and an improved 13-megapixel rear camera capable of recording 4k resolution video with a duel LED flash. The device also came with new software features along with new infrared proximity sensors. The Moto X Play and Moto X Style smartphones were announced in July 2015, and were released in September 2015. Many customers who have ordered customized Moto X Pure Editions via Motorola's website have experienced delays receiving their devices. These delays have been attributed to issues including: manufacturing issues, lack of parts needed to complete assembly of custom phones (black fronts, Verizon SIM cards and 64 GB versions), a possible redesign due to initial phones having a defect that causes one of the front facing speakers to rattle at high volume and multiple day delays clearing U.S. Customs at FedEx's Memphis, TN hub due to issues related to the import paperwork. On November 13, 2013, Motorola Mobility unveiled the Moto G (1st generation), a relatively low-cost smartphone. The Moto G will be launched in several markets, including the UK, United States, France, Germany, India and parts of Latin America and Asia. The Moto G is available in the United States, unlocked, for a starting price of US$179. The device is geared toward global markets and some US models support 4G LTE. Unlike the Moto X, the Moto G is not manufactured in the United States. On September 5, 2014, Motorola Mobility released its successor to the 2013 version of the Moto G, called the Moto G (2nd generation). It came with a larger screen, higher resolution camera, along with dual front-facing stereo speakers. On July 28, 2015, Motorola Mobility released the third generation of the Moto G series, called the Moto G (3rd generation), in a worldwide press conference in New Delhi, India. It retained the same screen as before but upgraded the processor and RAM. Furthermore, it has an IPx7 water-resistance certification and comes into two variants - 1GB RAM / 8GB ROM and 2GB RAM / 16GB ROM. The device also has the latest (at the time) Android Lollipop OS v5.1.1. In May 2016, Motorola released three fourth generation Moto G smartphones: Moto G⁴, Moto G⁴ Plus, and Moto G⁴ Play. The Moto E (1st generation) was announced and launched on May 13, 2014. It was an entry-level device intended to compete against feature phones by providing a durable, low-cost device for first-time smartphone owners or budget-minded consumers, with a particular emphasis on emerging markets. The Moto E shipped with a stock version of Android "KitKat." The Moto E (2nd generation) was announced and launched on March 10, 2015, in India. Released in the wake of its successful first generation, the second generation of the Moto E series still aims to provide a smooth experience to budget-oriented consumers. It increased the screen size to 4.5" but kept the resolution at 540 x 960px. It came in two versions, a 3G-only one powered by a Snapdragon 200 chipset and a 4G LTE version powered by a Snapdragon 410 chipset. As before, it shipped with a stock version of the latest (at the time) Android 5.0 "Lollipop". In 2015 Motorola Mobility marketed the Moto E with the promise of continual updates and support, "And while other smartphones in this category don't always support upgrades, we won't forget about you, and we'll make sure your Moto E stays up to date after you buy it." However, 219 days after launch Motorola announced that it was to cease support for the Moto E. It was later announced that the device would receive further updates in Canada, Europe, Latin America, and Asia (excluding China). China and the US carrier-branded versions of the device will not receive further updates. The Nexus 6 was announced October 15, 2014 by Motorola Mobility in partnership with Google. It was the first 6-inch smartphone in the mainstream market, and came with many high-end specs. It was the successor to the Nexus 5, Google's previous flagship phone from their Google Nexus series of devices. Its design was similar to the Moto X (2nd generation) but with a larger display and dual, front-facing speakers rather than the single front-facing speaker on the Moto X. It was the first phone running vanilla Android Lollipop, receiving software updates directly from Google. On January 26, 2015, Motorola Mobility announced that they would sell the Moto X Pro in China. The Moto X Pro was similar to the Nexus 6 in terms of hardware, but excluded all of Google's services and applications. The Droid Turbo (Moto Maxx in South America and Mexico, Moto Turbo in India) features a 3900 mAh battery lasting up to two days. Motorola claims an additional eight hours of use after only fifteen minutes of charging with the included Turbo Charger. The device is finished in ballistic nylon over a Kevlar fiber layer and is protected by a water repellent nano-coating. The Droid Turbo uses a quad-core Snapdragon 805 processor clocked at 2.7 GHz, 3 GB RAM, a 21-megapixel camera with 4K video, 5.2-inch screen with resolution of 2560 × 1440 pixels. The Droid Turbo includes 32 or 64 GB of internal storage, while the Moto Maxx is only available in 64 GB. Moto 360 is a round smartwatch, powered by Google's Android Wear OS, a version of Google's popular Android mobile platform specifically designed for the wearable market. It integrates Google Now and pairs to an Android 4.3 or above smartphone for notifications and control over various features. The second version of this smartwatch was released in 2015. The company has licensed its brand through the years to several companies and a variety of home products and mobile phone accessories have been released. Motorola Mobility created a dedicated "Motorola Home" website for these products, which sells corded and cordless phones, cable modems and routers, baby monitors, home monitoring systems and pet safety systems. In 2015, Motorola Mobility sold its brand rights for accessories to Binatone, which already was the official licensee for certain home products. This deal includes brand rights for all mobile and car accessories under the Motorola brand. In 2016, Zoom Telephonics was granted the worldwide brand rights for home networking products, including cable modems, routers, WIFI range extenders and related networking products. ↑ "It's official: Motorola Mobility now belongs to Lenovo". cnet.com. Retrieved 2014-12-25. 1 2 "Motorola Mobility Launches as Independent Company" (Press release). Motorola Mobility. January 4, 2011. Archived from the original on February 21, 2012. Retrieved August 13, 2013. ↑ Tsukayama, Hayley (August 15, 2011). "Google agrees to acquire Motorola Mobility". The Washington Post. Retrieved August 15, 2011. ↑ "Google to Acquire Motorola Mobility" (Press release). Google. August 15, 2011. Retrieved August 15, 2011. ↑ Bradshaw, Timothy ‘Tim’ (August 15, 2011). "Google buys Motorola mobile phone division". Financial Times. Retrieved August 15, 2011. ↑ Mick, Jason (May 2, 2012). "Motorola Bleeds More Cash as it Waits for Google to Save It". DailyTech. Retrieved January 3, 2013. ↑ Richtel, Matt; Wortham, Jenna (August 21, 2011). "Motorola's Identity Crisis". New York Times. The New York Times Company. Retrieved January 3, 2013. 1 2 Page, Larry (August 15, 2011). "Supercharging Android: Google to Acquire Motorola Mobility". Official Google Blog. 1 2 Cheng, Roger (August 15, 2011). "Motorola struggled before the Google deal". CNET. Retrieved January 3, 2013. ↑ "Google CEO: 'Anticompetitive' Apple, Microsoft forced Motorola deal". Apple Insider. August 15, 2011. Retrieved August 15, 2011. ↑ Drummond, David (August 3, 2011). "When patents attack Android". Official Google Blog. Google Inc. Retrieved August 3, 2011. ↑ "US gives its blessing to Google's Moto Purchase". Engadget. Feb 13, 2012. ↑ "Google completes purchase of Motorola Mobility". BBC News. May 22, 2012. Retrieved August 13, 2013. ↑ "Google Cutting 4,000 at Motorola Unit". ABC News. August 13, 2012. Retrieved January 3, 2012. ↑ "ARRIS To Acquire Motorola Home Business For $2.35 Billion In Cash And Stock" (Press release). Arris Group. December 19, 2012. Retrieved January 3, 2013. 1 2 "Google's Motorola Mobility to Close Factory in Texas". The Wall Street Journal. Retrieved September 5, 2014. ↑ "Under Lenovo, Motorola picks a new but familiar leader". Engadget. Retrieved April 15, 2014. ↑ "Moto G resurrects Motorola in UK market". CNET. Retrieved May 14, 2014. ↑ "Motorola ships 6.5 million phones in 2014 thanks to Moto G.". CNET. Retrieved May 14, 2014. ↑ "Motorola aims for Indian buyers with super-cheap Rs 6,999 Moto E". The Guardian. Retrieved May 14, 2014. ↑ "Motorola to Sell the Moto E Low-Priced Smartphone First in India". IndiaRealTime. The Wall Street Journal. Retrieved May 14, 2014. ↑ "Google sells Motorola to Lenovo for $2.91 billion". The Verge. Retrieved January 30, 2014. ↑ "Lenovo's BlackBerry takeover was reportedly thwarted by the Canadian government". The Verge. Retrieved January 30, 2014. ↑ "Google to keep Motorola's Advanced Technology group, including Project Ara modular phone". The Verge. Retrieved January 30, 2014. ↑ "Google to buy 5.94 percent stake in Lenovo after Motorola Mobility deal". NDTV. Retrieved May 19, 2014. ↑ "Lenovo Completes Motorola Acquisition". The Wall Street Journal. October 30, 2014. Retrieved October 30, 2014. ↑ "Motorola returns to China with launch of Moto X, Moto X Pro, and Moto G". The Verge. Retrieved January 27, 2015. 1 2 3 4 Savov, Vlad (July 29, 2015). "Under Lenovo, Motorola is more like Google than it ever was". The Verge. United Kingdom. Retrieved August 5, 2015. ↑ Burt, Jeffrey (August 28, 2015). "Lenovo Moves Smartphone Efforts to Motorola.". eWeek. 1 2 "Motorola's Next Chapter as a Brand". Motorola Mobility. Retrieved 30 January 2016. ↑ "Motorola won't kill the Moto G, but be prepared for fewer phones". The Verge. Retrieved 13 January 2016. ↑ "Goodbye, Moto(rola). Iconic brand name to be phased out". CNET. CBS Interactive. Retrieved January 9, 2016. ↑ "Lenovo is not killing off Motorola's best-selling smartphone (Updated)". Mashable. Retrieved 29 January 2016. ↑ "Motorola embraces the ethos of cool". MSNBC. April 11, 2006. Retrieved December 22, 2006. ↑ German, Kent (November 9, 2005). "Razr refresh: Motorola's fashion cell phones". CNet. Retrieved October 25, 2010. ↑ "Motorola Ships 50 Millionth MotoRazr" (Press release). Motorola. July 18, 2006. Archived from the original on August 13, 2006. Retrieved August 13, 2013. ↑ Ziegler, Chris (May 15, 2007). "The Motorola Razr 2". Engadget Mobile. Retrieved June 23, 2007. ↑ Nguyen, Vincent (January 23, 2008). "iPhone sales rocking and eating Razr's lunch at the same time". Phone mag. Archived from the original on December 30, 2008. ↑ Crockett, Roger (January 24, 2010). "What Can Brown Do for Motorola?". BusinessWeek. Retrieved December 15, 2010. 1 2 Reardon, Marguerite (May 15, 2007). "Is Motorola's cell phone revamp enough?". News. CNET. Retrieved December 15, 2010. ↑ Lappin, Joan (February 20, 2007). "Motorola's Zander Has Real Trouble Now". Forbes. Retrieved December 15, 2010. ↑ "Motorola to Split Into Two After Phone Sales Slide (Update10)". Bloomberg. March 26, 2008. Retrieved April 2, 2009. ↑ Bartash, Jeffry (November 30, 2007). "Struggling Motorola back in a familiar position". MarketWatch. Retrieved January 3, 2013. ↑ Kawamoto, Dawn; Krazit, Tom (November 30, 2007). "Motorola's Zander out after Razr deemed one-hit wonder". CNet. Retrieved January 3, 2013. 1 2 Burrows, Peter (November 16, 2009). "Moto Droid off to a Good Start. But Is It Good Enough?". BusinessWeek. Retrieved January 3, 2013. ↑ Lappin, Joan (February 20, 2007). "Motorola's Zander Has Real Trouble Now". Forbes. Retrieved January 3, 2013. ↑ Ogg, Erica (January 8, 2007). "Motorola's mission: Make everything mobile". CNet. Retrieved January 3, 2013. ↑ "Motorola profit slides on mobile woes; shares hit 5-year low". MarketWatch. January 23, 2008. Retrieved August 17, 2011. ↑ "Gartner Says Worldwide Mobile Device Sales to End Users Reached 1.6 billion Units in 2010; Smartphone Sales Grew 72 Percent in 2010" (Press release). Gartner. February 9, 2011. Retrieved January 3, 2013. ↑ Reardon, Margeurite (October 30, 2008). "Motorola's struggle for survival". CNet. Retrieved January 3, 2013. ↑ "The Cliq: Motorola's first Android phone". CNET. CBS Interactive. Retrieved November 7, 2014. 1 2 Mui, Chanka (October 17, 2012). "Lessons From Sanjay Jha's Transformation Of Motorola". Forbes Contributor blog. Forbes. Retrieved January 3, 2013. ↑ Segan, Sascha (October 18, 2009). "Verizon Tips Oct. 30 for 'Droid' Phone". PC Magazine. Retrieved August 17, 2011. ↑ "Verizon, Motorola unveil the Droid". CNET. CBS Interactive. Retrieved November 7, 2014. ↑ "Droid Sales and the Android Explosion". PC World. IDG. Retrieved November 7, 2014. ↑ Grossman, Lev (December 8, 2009). "The Top 10 Everything of 2009 – Top 10 Gadgets". Time. Time Inc. Retrieved January 20, 2011. ↑ Perez, Marin (June 11, 2010). "DROID does – but Motorola can't rest on its laurels". The Full Signal. Dennis Publishing. Retrieved January 3, 2012. ↑ "Motorola's Q2 handset sales drop, but Droid X pushes smartphone numbers up". Geek.com. Retrieved November 7, 2014. ↑ Dignan, Larry (October 28, 2010). "Motorola: Droid X Selling 'Extremely Well'". Seeking Alpha. Retrieved May 19, 2011. ↑ Savov, Vlad. "Take a Look at the World's First Dual Core Phone". Entertainment Buddha. Retrieved January 3, 2013. ↑ "Atrix 4G with Laptop Dock". Motorola Mobility. Retrieved January 12, 2011. ↑ Kamal, Kal (April 29, 2011). "Meanwhile, Motorola launches world's first Android 3.0 Honeycomb tablet XOOM in Malaysia". Grey Review. Retrieved June 7, 2011. ↑ Bowman, Arthur (May 11, 2011). "Android 3.1 Honeycomb Update To Verizon Motorola XOOM Users First". BWOne. Retrieved June 7, 2011. ↑ "CTIA Awards: Droid Razr Maxx named best smartphone". Hindustan Times. Retrieved May 11, 2012. ↑ Chris Velazco (August 1, 2013). "The New Motorola Is Focusing On "Very Few" Devices, And A Low-Cost Phone May Be Next". TechCrunch. AOL Inc. Retrieved August 4, 2013. ↑ Alexei Oreskovic (May 29, 2013). "Motorola's new 'Moto X' phone to be made in Texas". Yahoo! News. Archived from the original on July 12, 2013. Retrieved July 12, 2013. ↑ Christopher Mims (May 30, 2013). "Google's new "Moto X" superphone will spy on you 24/7, and you'll like it". Quartz. Retrieved July 12, 2013. ↑ Matt Clark (July 2, 2013). "Motorola's Moto X is the Smartphone 'You Can Design Yourself'". IGN. IGN Entertainment, Inc. Retrieved July 12, 2013. ↑ Joanna Stern (July 3, 2013). "Moto X Details Revealed: Colors, Wallpapers, Engravings Will Be Customizable at U.S. Factory". ABC News. Retrieved July 12, 2013. ↑ Christopher Mims (July 11, 2013). "Google is about to spend half of Apple's annual marketing budget promoting a single phone". Quartz. Retrieved July 12, 2013. ↑ Dave Lee (August 1, 2013). "Moto X 'always listening' phone launched by Google's Motorola". BBC News. Retrieved August 4, 2013. ↑ "Motorola targets budget buyers with Moto G smartphone". BBC News. November 13, 2013. Retrieved November 16, 2013. ↑ "Moto Maxx: Choose to live life unplugged". Motorola Mobility. November 5, 2014. Retrieved January 27, 2015. ↑ "Moto Maxx brings its 3900 mAh battery to Latin America". Android Authority. November 5, 2014. Retrieved January 27, 2015. ↑ "The New Moto Z Family with Moto Mods: Transform Your Smartphone in a Snap". Motorola Mobility. June 9, 2016. Retrieved November 20, 2016. ↑ "Android Wear". Android.com/wear. Google. Retrieved February 7, 2014. ↑ "Motorola Home". Motorola Mobility. July 12, 2016. Retrieved July 12, 2016. ↑ "Binatone Acquires License Rights to Motorola Mobility's Accessories to Scale Its Global Business". BusinessWire. September 3, 2015. Retrieved July 12, 2016. ↑ "Zoom(R) Telephonics Expands Motorola Brand License Rights to Include Consumer Wi-Fi Home-Networking Products". Morning Star. August 22, 2015. Retrieved October 8, 2016.